"It isn't conceivable, really, that there would not be life." Hyped beyond belief a few months ago prior to its television debut, Alien Planet premiered on The Discovery Channel, and was a ratings success for the network. Similar programs have appeared on that channel in the past, utilizing the best in CG technology to recreate the time when dinosaurs roamed the earth, among other eras. Those previous shows were exciting and very realistic, getting as close to an actual movie as The Discovery Channel will ever get. Alien Planet takes us to a fictional world, known as Darwin IV, where, unlike those earlier, similarly themed shows, there is an actual plot. A probe called Von Braun is sent from Earth to explore this planet. This large probe houses smaller probes that will actually survey the planet, serving as the cameras that film what we see in the program. This is the extent of the storyline, but there is a nice twist involving the probes that adds a bit of spice to the proceedings. The first half really gets things off to a raucous start, as we get a feel for Darwin IV and the plans for Von Braun. Given the incredible look of the production and the fascinating "mission" that's being described, this first half is difficult to turn away from. When the probes actually get to the planet, things get even more exciting, as the two rovers (named Leo and Ike) encounter a wide variety of aliens. These creatures come in many shapes and sizes that will remind you of creatures of Earth, only in a completely mutated form. They range from spider-like tree-crawlers to dinosaur-esque beasts. Many familiar faces and voices appear throughout the program, including John C. McGinley (Scrubs), who narrates the program. A bevy of scientists are on hand to "sell" the existence and technical aspects of the planet and its inhabitants, including Jack Horner and James Kirkland, a pair of paleontologists. Alien Planet was actually based on the book, Expedition, by Wayne Barlowe, and these scientists do their best to reproduce the ideas that were introduced in that futuristic tale. We also receive visits from physicists Stephen Hawking and Michio Kaku, NASA scientist Victoria Meadows, general scientist James Horvath, and none other than the daddy of Star Wars himself, George Lucas. Unless you're really into the technical jargon that goes with the territory, the only problem with this show is the large amount of time devoted to these scientists' techno-babble. Fortunately, the editing makes for a brisk pace that keeps the CG action coming after mercifully short individual interview segments. It's this flow that saves the day when Alien Planet could have been a huge, boring mess. Overall, this is a show that most of the family can enjoy. There are some intense sequences involving the creatures, but there's nothing that would scare the wits out of the young ones. Kids will more than likely spend the entire running time just staring at the CG aliens; however, prepare for a few looks of boredom from them during the scientific interviews. 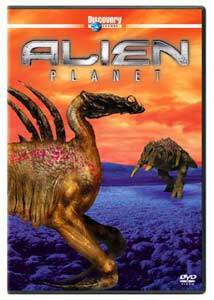 Those above the age of 13 or so will realize that the nice balance of interviews and animation makes Alien Planet a show that is worth watching repeatedly, as they will learn something new (albeit not exactly real) every time they give this disc a spin. Image Transfer Review: This show is presented in nonanamorphic 1.78:1 widescreen, which was how it was presented on TV. Everything is nearly perfect, from the crisp detail of the CG-animated creatures, to the incredible landscapes of the planet. The colors are exquisite, with rich lush reds and blacks among them. There isn't a single bit of dirt, grain, or other print flaws that could have taken away from the quality of the presentation. Audio Transfer Review: The audio is Dolby Digital 5.1, and the surrounds are running on all cylinders. John C. McGinley's excellent narration lords over the proceedings, blending in perfectly with the rest of the mix. The incredibly weird sound effects travel across the soundstage, always utilizing the appropriate speaker, regardless of the situation. There's some nice subwoofer action as well, adding some nice punch to the sci-fi action. Extras Review: The only extras are a Full Throttle Preview for other Sony DVDs, and a collection of Scientist Interviews. These numerous segments feature talks with Stephen Hawking, Jim Garvin, Jack Horner, and Michio Kaku, during which they expand on what is discussed in Alien Planet. The Discovery Channel takes their original programming to the next level with 2005's Alien Planet. This mock-exploration of a fictional planet features fascinating, realistic discussion, and even more incredible CG-animated "footage" from probes that traveled to that world. Incredible audio and video presentations mirror the show's television broadcast (the high-definition version, that is), and the huge collection of extra interview footage will keep fans of technical science speak happy for quite some time.